The next Construction Institute Dinner meeting will be on Tuesday, March 20. Come get a contractor’s perspective on the massive project’s challenges and highlights. Beginning April 17, 2017, nearly two months after the Lake Oroville spillways were compromised, Kiewit, the California Department of Water Resources (DWR), the Federal Energy Regulatory Commission (FERC) and other dam safety agencies began working to have a functional 3,000-foot spillway in place by Nov. 1st. 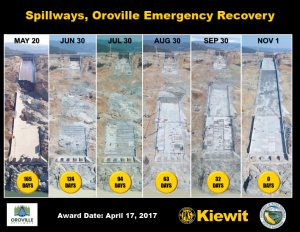 Kiewit began work on the damaged main spillway May 21st leaving 165 days to complete the first phase of the repair. The repair consisted of patching and reinforced the top 730 feet of the spillway in 2017, replacing an 870-foot section of the upper chute and 350 feet of the lower chute to final design. Filling two large scour holes in with Roller Compacted Concrete RCC and constructing a 1,050-foot temporary middle section to ensure the spillway could safely handle flows of 100,000 cubic feet per second (cfs). Cost is $40 or $15 for students and includes a multi-course Chinese banquet. 7 p.m. dinner; 8 p.m. program; 9:15 p.m. raffle and adjourn. Parking: Street parking is limited or building garage ($2 flat rate); no validation. Registration: Pre-registration closes March 16th. No refunds after March 16th. The program will conclude with the CI Section Scholarship Fund raffle. Please remember to bring donations of raffle prizes to this event so we can insure the success of this important cause. For information on the Construction Institute, please contact Douglas Higashi at 510-287-1677.